Pier Fire Update, 8:20am, 9/5/17. 20,529 Acres Burned. New update as of 7:45am 9/6/17 here. Info below is outdated. Residents affected by the Pier Fire are encouraged to attend a follow-up community meeting on Tuesday, September 5 at Porterville College located at 100 E. College Avenue in Porterville. The meeting is set to begin at 6 p.m. and will take place in the Student Center. Fire Summary: On the western portion of the fire, south of SCICON and east of Balch Park Road, significant progress was achieved as firefighters were able to go direct along the fires edge. With additional dozer work, continued improvement of the fireline is anticipated. On the northern portion of the fire, in the Wishon area, the fire is being successfully backed down towards the North Fork and Middle Fork of the Tule River. There was a twenty-acre spot fire near the 20S12 road which was successfully lined utilizing helicopter water drops. In the area of Rodgers Camp, the fire gained strength becoming very active as it moved aggressively and bumped into Bateman Ridge. This resulted in a significant air operation to secure control lines in this area of the fire. 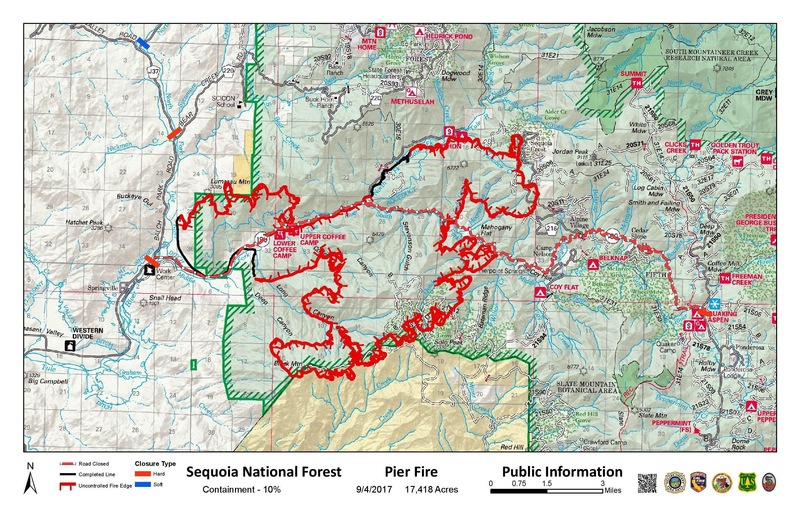 Much of the southern and lower western edge of the fire has been prepared and reinforced for potential burning operations once favorable conditions return.